We have a winner in our cat cover contest! Though actually it was a tie. There were two cats who received the same number of votes, but one of them turned out to be an internet cat while the other one is (I hope) a real live cat belonging to a real live MoJo reader. It was also my favorite cat cover of the bunch. 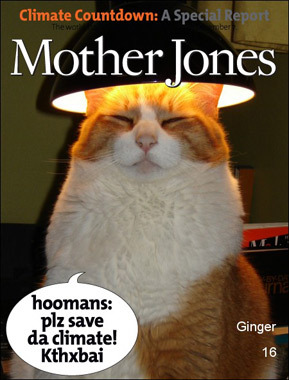 So by the awesome tiebreaking power vested in me as final coverblogging judge, I declare the winner of our cat cover contest to be Ginger, possibly the smuggest looking cat I’ve ever seen. All hail Ginger! The dynamic duo will be back next week. In the meantime, if you’re Ginger’s owner, email me to claim your prize. Have a good weekend, all.